Do you know of a student that is interested in pursuing a career in the field of mineral extraction? Or maybe you know a student that is interested in one of the many fields that support this field. If so, please pass along the 2018 MAA Scholarship Application form and have them submit it to the MAA office no later than March 16, 2018. All scholarship recipients will be announced prior to the April 19, 2018 MAA Awards Night. 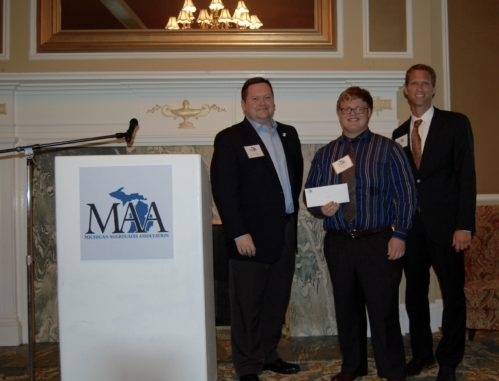 Each year Michigan Aggregates Association Foundation provides a scholarship to a student(s) enrolled in an accredited institution of higher learning. The scholarship will be awarded at the MAA Winter Meeting. Must be admitted to an accredited institution of higher learning (four year university/college, community college or technical school). Eligible to students that are pursuing a professional field of mineral extraction or one that supports this field. All candidates must complete an MAA Scholarship Application in writing. Including a short essay, "What type of career are you pursuing in the professional field of mineral extraction and how do you plan to achieve this?" Candidate must be enrolled in a curriculum that is affiliated with the extraction of mineral resources as judged by the Selection Committee.